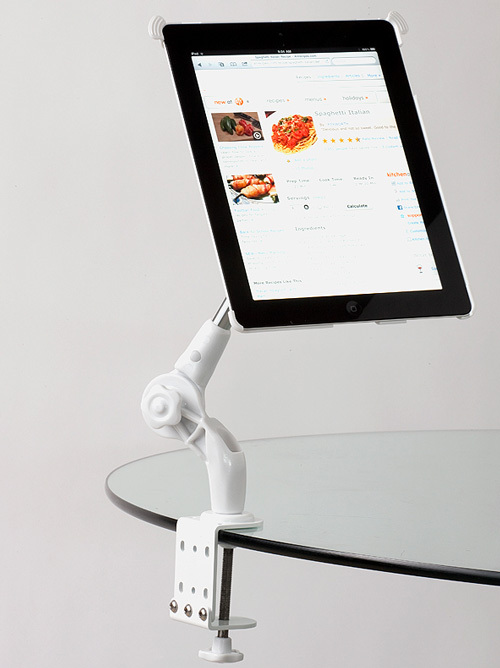 The SpiderArm is a stand with three articulated arms for iPad. When you order it, you can choose your model of iPad so the secureSnap case fits your model of iPad. 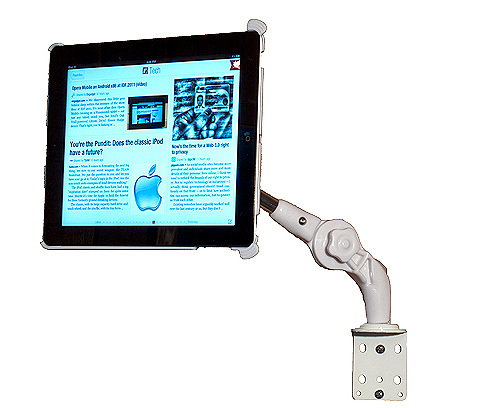 The mounting case maintains your iPad very securely in its grip, but installing the iPad in it can be a bit difficult as the clips are very tight. 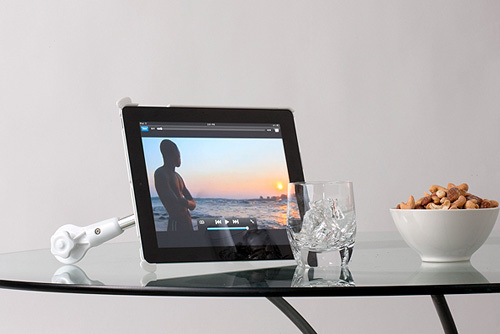 If you have a case on your iPad, you’ll have to remove it to use the SpiderArm case. The SpiderArm case is not something you can remove from the arm to travel or protect your iPad because the rotation ball is fixed to it. The different arm sections can be added or removed at will, and this then makes the arm usable in different situations. The system comes with two base options; with the C-clamp you can attach it to any furniture in your house, and the C-clamp can be transformed into a wall mount; with the surface mount it can be attached to the top or bottom of many surfaces. 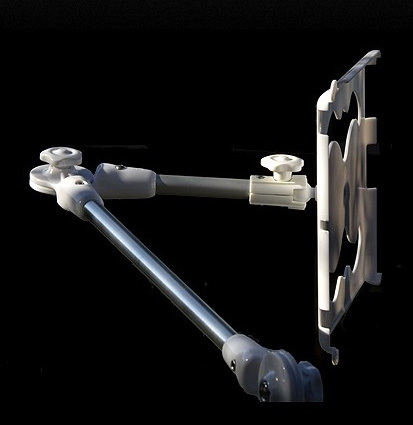 While the SpiderArm offers many possibilities on paper, they are not easily interchangeable. For example, if you want to remove or add an arm’s section, you must totally unscrew then screw the sections together. I would have appreciated a quick release mechanism to add or remove sections. 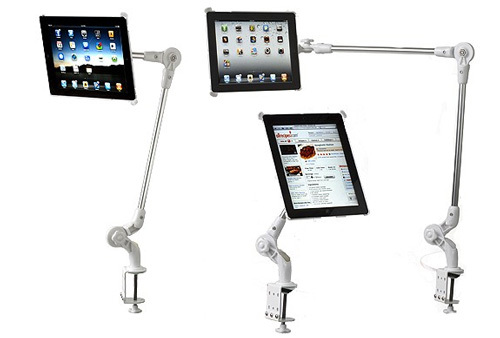 If you install the three arm sections and plan to use your iPad (touching the screen to access software functions), the arm will swing with the inertia created by your finger if you don’t stabilize it. Adjusting the angle of each section is also a tedious process of screwing and unscrewing sections until you get the proper adjustment. 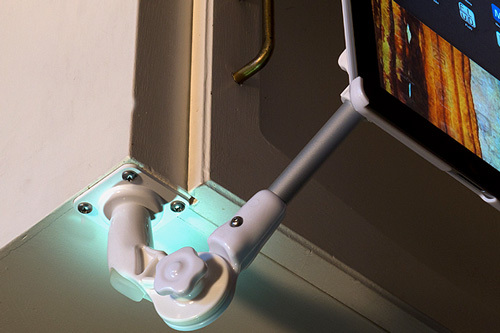 While the SpiderArm offers many possibilities, it is not built to make it an all around the house solution at once. If you want to have your iPad fixed in the kitchen, it is great. But if you plan to use the SpiderArm for multiple in-house usage interchangeably (say in the kitchen and in the living room), you may get tired or screwing/unscrewing the sections for each room.